Ferrari has unveiled two new special edition supercars at a private event. The Ferrari Monza SP1 and Monza SP2 are based off the 812 Superfast and are likely to be one-offs. Last week, we had reported that Ferrari was planning to launch three limited edition models based on the 812. These included the Monza and an Aperta, which could be revealed at a later date. The Monza SP1 and SP2 are inspired by the 250 Testa Rossa from the 1950s. 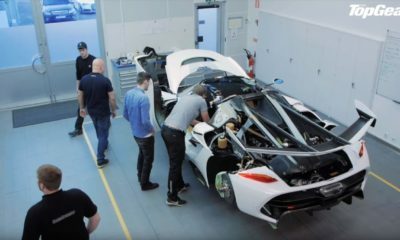 These first images give us a peek into the car’s cockpit, while also revealing bits of the bodywork. The Monza SP1 appears to be a single seater with a single roll-over hoop. The car finished in a silver with yellow highlights. The interior comprises of a leather wrapped seat and the steering wheel carried over from the 812 Superfast. The Monza SP2 is a 2-seater finished in black and has red interiors. The cars have a short windshield mimicking Ferrari race cars from the past. Technical details of these cars are still unknown. However, we suspect that both cars will probably have the same 6.5-litre, naturally-aspirated V12 engine with 800 hp and 530 lb-ft. The cars are likely to borrow most of the 812’s underpinnings as well.